Clinic Synopsis: With little, or no, guitar skills, band directors can help the guitarist in the jazz band get the right sound and play stylistically correct. Participants in this session will be given information to pass on to their jazz band guitarist that will improve their sound and playing. Topics will include: getting the correct sound, what chords to play, stylistic rhythm techniques, and soloing tips. Band directors with guitar skills will also benefit from the session. Clinician Biographical Information Mike Christiansen is Professor Emeritus in the Music Department at Utah State University. 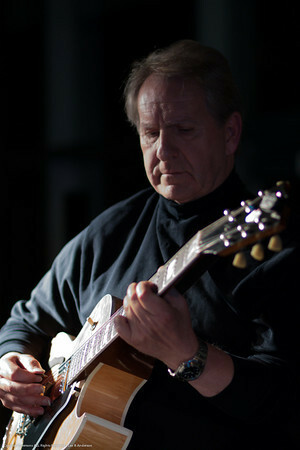 He founded the guitar program at USU where he was Director of Guitar Studies for 39 years. In 1994, he was selected as Professor Of The Year at Utah State University. In December of 2012, Mike was selected as a U.S. Carnegie Professor of the Year. In 2013, he was invited to be a TED speaker, and in 2017 he was selected as the USU Distinguished Alumnus. Mike is currently Director of Curriculum for Consonus Music. He has authored/co-authored over 40 guitar and instruction books. Mike is a popular clinician at conferences throughout the United States. He has performed with many artists including: Jack Peterson, Tommy Emmanuel, Glen Frey (the Eagles), the Mormon Tabernacle Choir, Natalie Cole, Take Six, and Alfie Boe.